Android 4.4 KitKat is finally here It's Official: Nexus 5 And Android 4.4 KitKat Are Here It's Official: Nexus 5 And Android 4.4 KitKat Are Here The Nexus 5 is now on sale in the Google Play Store and it's running the brand new Android 4.4 KitKat, which will also be rolling out to other devices "in the coming weeks." Read More ! But as longtime Android users know all too well, its official rollout will be slow, gradual, and for many, non-existent. That’s why many people don’t wait around for official builds to pass through carriers and hardware manufacturers, instead opting to flash custom ROMs or download leaked APKs. Yes, it’s a tad impatient, but for us techie folk who like to live on the bleeding edge, it’s worth it. Now, KitKat didn’t introduce that many ground-breaking features, and it didn’t reinvent the mobile landscape; it simply refined what has become a solid operating system. But that’s not to say that it doesn’t have some cool features. Thankfully, a few of those cool features are available now, either through official APKs or third-party apps. The new stock launcher in KitKat is all about Google. Scroll all the way to the left, and you’re making a Google search. Tap on the persistent search bar at the top, and you’re making a Google search. Say, “OK Google” at any time, and you’re making a Google search. I think you get the idea. But this newfangled launcher is actually a pretty sweet improvement over the stock Jelly Bean launcher. To get it requires installing three different APKs because for the launcher to work, it also needs Google Now to be updated and Play Services. You can view some detailed instructions and get help over on the XDA-Developers forum for the topic, but the basic premise is simple: Download this ZIP file (mirror [No Longer Available]), unzip it, place the three APK files on your phone, and install them. When you press the home button, it should prompt you to select “Launcher” as your default launcher. One day, Hangouts will be the amazing, all-encompassing communication app that the world needs, but that day is not today. However, that day is a little bit closer as Hangouts jumps from version 1.2 to 2.0 with the KitKat update, allowing for the app to handle SMS, MMS, animated gifs, and improved Emoji support. Unfortunately, Android users don’t get the calling features and Google Voice integration that iOS users received Google Hangouts Updates On iOS To Offer Free Calling & Animated GIFs Google Hangouts Updates On iOS To Offer Free Calling & Animated GIFs Google Hangouts has a new update on iOS with a couple of really cool features, like the ability to make phone calls, Google Voice support, and animated GIFs can now play in-line in chats. Read More recently (Why, Google? Why? ), but they have promised to bring those features “soon.” Oh well. In the meantime, you can enjoy using Hangouts as your default SMS app, and don’t forget to snag some awesome animated GIFs The 5 Best Sources For Animated GIF Images The 5 Best Sources For Animated GIF Images I’m convinced that the animated GIF reveals something about humanity. Present your average person with a repetitive moving picture and they’ll become absolutely entranced. I’ve lost many hours of my life to dancing bears and... Read More to make use of the new feature. To get started, download Hangouts 2.0 from one of the mirrors below, transfer the file to your Android device, and install like normal. If you have any major issues, you can always uninstall it and reinstall version 1.2 from the Play Store. KitKat supports native screen recording! Hooray for all those tutorial makers! But we’ve actually been able to do that for a while as long as you have root access. If you’re new to rooting, be sure to check out our extensive Android rooting guide Android Rooting Guide Android Rooting Guide Read More . There’s a number of apps that will let you do this, a quick search of the Play Store will show you that, but my favorite is SCR Screen Recorder. It’s simple to use: you just install it, tap record, grant it root permission, and you’re on your way. It also has a settings menu so you can adjust things to your liking if need be. There is a free version as well as a $5.21 paid version that removes the watermark, notification icon, and allows you to record for longer than 3 minutes. The new caller ID in the KitKat dialer looks awesome. It searches through Google’s databases for people or businesses registered to that number and shows you their name and photo even if they’re not in your contacts. Unfortunately, there hasn’t been a lot of luck getting the dialer to function properly on non-KitKat devices, so you’re stuck with third-party options. There are some great choices out there, though! We’ve gone through four great caller ID apps Four Free Caller Identification Apps That Will Annoy Your Telemarketers Four Free Caller Identification Apps That Will Annoy Your Telemarketers Using one of these caller ID apps, you can easily block telemarketers and know who's calling you before you answer. Read More that should tie you over until you can break yourself off a piece of that KitKat. Above are some screenshots from Thread, the best of the Caller ID apps that displays relevant information from whoever’s calling, including their picture, previous text messages, and social media updates. Keeping up with Google’s continued efforts to improve Android’s photo capabilities, the new default Gallery has a quality photo editor built-in. Aside from that, it looks largely the same. The editor has a few preset filters, preset border options, the ability to manually tweak many aspects of the filters, and options for cropping, rotating, mirroring, and straightening your photos. There’s even a slide-out menu to the right that displays your edit history, allowing you to revert back to any point at any time. Plus, the photo editor is nondestructive, so any changes that are made are saved as a new photo, ensuring that your original photo is preserved. You can download the Gallery apk from this XDA thread. To install it, though, you’ll have to use a file browser with root permission to place it under System > Apps and then restart your phone. KitKat comes with a lot of new features, but most of them are pretty minor. Some of the smaller updates include the stock apps like Email, Clock, Camera, and several new fonts, wallpapers, sounds, and boot animations. All of these can (hopefully) work on your Jelly Bean device thanks to the amazing folks over at Android Police and XDA-Developers. Follow the links for installing/flashing instructions. This is part of what makes the Android community so great. A new version comes out and suddenly everyone’s up in a flurry grabbing APKs, explaining how to get certain features now, modding, rooting, and flashing everything they can get their hands on. It’s fun, and it also makes for a great smartphone. What’s your favorite new feature in 4.4 KitKat? Will you be flashing a new 4.4 ROM when it makes it to your device? Let us know in the comments. i downloaded the galley apk but i couldn't access the "gallery editor" whenever i did it just stopped responding and force closes is it because my android version is only 4.1? i don't really think so since the other apk's work fine pls. i need the link for the gallery editor it looks great! That's cause your cellphone it's using the JB Camera. Exclude the Camera App and the previous Gallery, than install the KK ones. I like this a lot! However, what about the transparent notification bar at the top? KitKat or your review is underwhelming. After reading it I am more excited about the next episode of Hawaii 50. Does anyone know if this will work on the LG G2? Or do you need stock android? Justin: I rather think you'll find that where techie folk live is on the "leading edge". Not the "bleeding edge". Phonetics can be dangerous and are best not ducked. I think "Leading edge" applies to the "useful" sharp blade, Like a new Android release. The "bleeding edge" is more akin to particle physics at CERN. What should I buy? 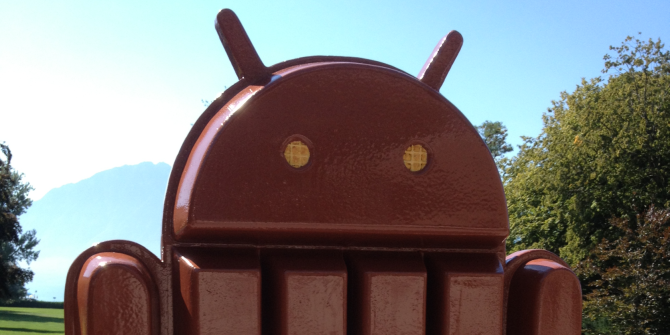 The samsung Galaxy s4, or the nexus 5 wit KitKat? Depends on what you want. If you want cutting-edge hardware and don't mind Samsung's skin and stuff on Android, go for the S4. If you want a rock-solid, future-proof phone with core Android and timely updates, go for the Nexus 5. For me, it's Nexus 5, no question. But it's up to you. Is reverting to the previous launcher and system apps a simple process? Please describe.